Gasol embraced a do-it-all role this season, even though his contract overshadows his performance. Got a little test for you, Pounders. Close your eyes and open your minds. Ignore the name, age and money listed above, and just consider the stats. Now imagine those numbers coming from a center in today’s NBA. Not bad, right? Now come back to reality and remember it’s Pau Gasol. It may be hard to do with the numbers glaring in your face, but if you can look past the contract it’s easy to remember that Gasol is still a good NBA center with some rare gifts that include a high basketball IQ, a passing game that far exceeds most bigs in the league, and the ability to stretch the floor out to the three-point line. He led the Spurs in assists (238) and is still one of the better defenders on a top-5 defense. He also led the team in defensive rebounds (490), was just barely behind LaMarcus Aldridge for second on the team in total rebounds (619), and finished third in blocks (71). On offense, his ability to stretch the floor makes him a good fit alongside Aldridge, especially as the latter has embraced an offensive role more oriented around the rim, and their perfected high-low game is nearly unguardable. 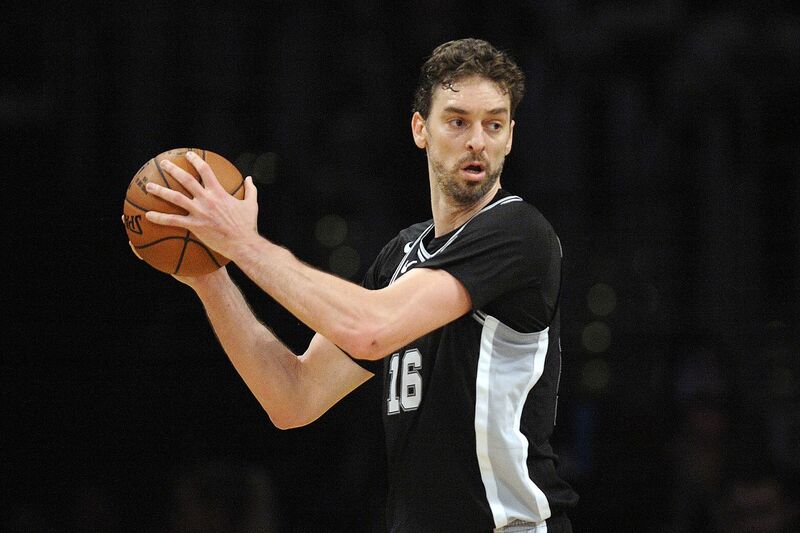 In a lot of ways Gasol is a perfect fit with the Spurs, but is he worth the cost? Most will say no, and they’re probably right: his play does not always match his pay, especially considering he suffered a drop of 18 percentage points in three-point shooting, going from a league-leading 53.8% last season to 35.8% this season on just as many attempts (1.6 per game). However, it is noteworthy that Gasol was willing to take less money. He opted out of his previous deal to give the Spurs some negotiating room in free agency (and with the hopes of signing a more long-term deal), and then took what the Spurs had left to offer him. It turned out to be more than many thought he was worth, but that’s not on him. There’s only one guaranteed year left on his contract, so it shouldn’t cripple the Spurs that much in the long term. In the meantime, Gasol remains a prototypical Spur: unselfish, willing to take on whatever role Gregg Popovich asks of him (be it starting or off the bench), a veteran leader, and an excellent role model off the court. He may be overpaid, but like it or not he’s still one of the Spurs’ top five players, and basically all advanced stats support that. Maybe he shouldn’t be, but it’s up to other players to take that title from him. As Bruno Passos mentioned last year, the more he can stay on the perimeter on offense, the less distance he has to travel to get back on defense. His time out there is also what likely allowed him to be the team’s top distributor. While it’s hard to expect him to hit threes at such an absurd rate as he did last a year ago, something in between his two seasons here would do nicely. Barring a successful trade (something the Spurs likely aren’t even looking at for the time being), Gasol and his contract will remain with the Spurs for at least one more season. He’s still a good player even if he’s overpaid, so the best thing Spurs fans can do is appreciate what the future Hall-of-Famer brings to the table, both on the court and from a leadership standpoint, and worry about what becomes of his contract next summer.